PSYOP Post Iraq Pullout Role – Back to Fort Apache? With the inauguration of President-elect Obama a scant 4 weeks away, much is being written about the projected pullback of ‘combat troops’ from major cities by June 30, 2009. While no one would doubt that ‘some’ troops will have to remain in Iraq beyond the June date, there are no exact figures. One expert quoted by the Times predicted that “roughly 10,000 American troops should remain in Baghdad after next June, with thousands more in other cities around the country”. What does this mean for PSYOP? For starters it looks like dispersed US forces will be housed in garrisons discretely positioned outside cities, yet poised to apply lethal force when needed. If anything, the need for information engagement is now increased and the resources to support it, especially security have become more attenuated. DOD has touted the overall training provided to the Iraqi Army, but it is unclear exactly what kind of PSYOP or Public Affairs Officer (PAO) training has been provided. Consequently while the tactical presence may be appropriately offset by having US forces out of the cities, it does not follow that information engagement will be diminished simply because the ‘combat’ troops are not deployed inside the cities. US CDRs at all levels down to and including companies have come to realize the importance of PSYOP and PAO. It follows that each garrison will need at least one Tactical PSYOP Team (TPT) and that these teams will have to be tied together with Reachback type support to include common messages, pre-produced products and the ability to quickly respond to enemy television propaganda offensives. Needless to say the teams must be backed with reliable interpreter support, preferably from individuals who come from the area surrounding the garrison. This distributed configuration will very likely require a high level of maturity and relationship building capability than found in a normal tactical situation. This is due to the fact that the deployed US force will remain fixed and must develop long term positive relationships with their Iraqi counterparts, Iraqi media, local leaders and the population at large. In this configuration the TPT must maintain close communication with the MNF PAO and any Iraqi personnel involved with information engagement. It is possible that the shibboleths of mixing PAO and PSYOP have not infected the new Iraqi hierarchy so that a few individuals can accomplish both missions within a single organization, however, this may not be the case so that the firewalling between PAO and PSYOP may still exist within the new Iraqi infrastructure. The PSYOP Task Force (POTF) HQ in the post pullout world will more closely resemble a corporate marketing department than ever before as each of the cities take on the flavor of marketing regions. Hopefully doctrine, training and PSYOP/PAO work products are evolving so that the transition will be a smooth one. Shoes and PSYOP seem to go hand in glove. I remember one evening in 1998 I was home alone and actually in charge of the TV and could watch whatever I wanted. As it turns out, I was fresh from my stint in Bosnia and “Wag The Dog” was one. Since I had never heard of it, and it featured Dustin Hoffman and Robert DiNiro I tuned it in. To my surprise it was all about PSYOP and centered around an “old shoe” theme. For those not familiar with the plot, a sitting US President needed to divert public attention from his personal sexual peccadilloes. Fast forward to this week and shoes are in the air again because a disgruntled Iraqi reporter threw a pair of shoes at President Bush. Today’s post is not about Mr. Bush or his legendary prowess at Dodge Ball, nor is it about the significance of shoes and soles thereof in the Arab world – it’s about seizing the initiative and mass PSYOP. 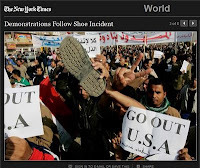 The picture above comes from the New York Times (http://www.nytimes.com/slideshow/2008/12/15/world/1215-SHOE_3.html) and is one of 8 ‘slides’ dealing with the post shoe protests. While the general tenor about progress in Iraq has had an uptick, and optimism that President Elect Obama will bring an end to the unpopular war permeates the media, nevertheless, the rapid response and size of protests in supporter of the reporter rather than the President is worthy of note. Clearly anti-Americanism is still a popular cause, one which will seduce people into group activity. As a MI type, I wonder who was behind the organization of these events. Crowds do not materialize absent organization and these protest crowds are no exceptions. The quick and dramatic reaction of our enemies should be noted, especially by those who advocate a hasty withdrawal from Iraq. The protests in support of the reporter seem to play out better visually than the actual shoe incident itself. It is clear that much remains to be done if the USG goal is to win popular support. The inauguration of President Elect Obama may be a good focal point for an information offensive designed to show that the New Year will bring significant change to Iraq and that the Iraqi people will need to shoulder more and more of the responsibility for the security and political climate of their country. It will not be an easy sell. The incoming Administration would do well to consider what their desired end state ought to be and what behavior on the part of the Iraqi people would demonstrate the successful achievement of that result. Meanwhile military PSYOP efforts should concentrate on local successes and build confidence in the new environment one neighborhood at a time. It is my contention that success in terms of popular support is a bottom up effort. The sum of a number of local successes is more significant than a top down view of popular satisfaction. 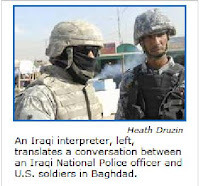 In what may be an outbreak of common sense the Stars and Stripes (http://www.stripes.com/article.asp?section=104&article=59339) reported that the military has lifted its ban on interpreters wearing masks. I had the great pleasure of hearing one of my long time PSYOP colleagues give a presentation on his tour in Iraq to a group of retired (some from as far back as WWII) CA Officers. He confirmed what some of the press is reporting and what I had suspected: many Iraqis support the US at their peril. Consequently even some senior officers (at least at that time c. 2005) came to work in civilian clothes and in civilian vehicles. It seems their neighbors didn’t even know their real jobs. Pressure on congress by an Oregon based organization was cited as one of the reasons for the change. Whatever the reason – the change is a good one and one that I personally applaud. The PSYOP Association (http://www.geocities.com/psyopassociation/membershipb.html) publishes a very useful e-mail publication called FrontPost. The publication reflects key events, trends and news in the PSYOP community worldwide and is a tremendous resource for PSYOP professionals. Monday’s edition featured two articles dealing with PSYOP, PAO and IO in Afghanistan. The first talked about an organizational change implemented by an American BG and the second article: “NATO scraps press, psy ops merger in Afghanistan” (http://www.alertnet.org/thenews/newsdesk/ISL373905.htm) proclaimed its undoing. Two aspects of the articles are worthy of discussion: NATO rules and the tacit assumption that PAO is always snow pure while PSYOP is always ‘propaganda’. If there are any lessons that the USG should have learned by now is that going to war alone is not a good thing and that terrorists are far more adept at information engagement than we are. NATO is a prime alliance for the USG. However, having served at the NATO Stabilization Force (SFOR) HQ in Sarajevo, I can tell you that it is a strange sociological beast. NATO organizations are cobble together based on nationalities and pay grades and often have the intrigue of a European Royal Court in the Middle Ages. Officers at the most senior levels within a NATO HQ wear two hats: NATO Officer and National Officer. Their Officer Efficiency Reports (OERs) are written by senior officers of their own nation and their generally unstated duty is to champion the priorities and causes of their nation – all within the bounds of the NATO organization. While an officer may be in Command, he/she must do so within the NATO rules and rituals. It is clear to me that US doctrine needs to dovetail with NATO doctrine. This effort in turn should take two different paths. On the one hand US forces should insure that their operations are IAW NATO tactics, techniques and procedures and on the other, US personnel assigned to NATO should continually strive to modernize NATO TTP so that they will optimize operations in the 21st century regardless of AO. Furthermore, these TTP should encompass actions against terrorists and insurgents. Once TTP are adopted by NATO, member nations and those aspiring to membership will train and ultimately fight employing them. Training as you fight takes on a new meaning – working in tandem with allies under common rules and TTP. This type of seamless integration would go a long way towards increasing the effects of allied operations and reduce the seeming advantage now enjoyed by our terrorist enemies. “But that order went against policy agreed by the 26 nations within NATO which recognises there is an inherent clash of interests between its public affairs offices, whose job it is to issue press releases and answer media questions, and that of Information Operations and Psy Ops. 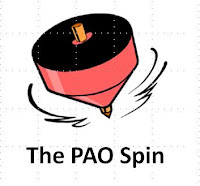 PAO remains a powerful lobby and has succeeded at elevating itself above both PSYOP and IO. This exalted position exists in spite of the fact that PAO will spin their releases and messages in the way that they see fit. The fact of the matter is that everyone works for the CDR and the CDR needs to streamline his/her information engagement forces so as to get the biggest bang for the buck and to be able to respond quickly and forcefully to deny the information advantage to the enemy. Splitting the forces goes against both the principles of warfare and marketing. The time has come for DoD to convene a small task force to address the notion of information engagement across the USG and to recommend to the new President how to gain and maintain the information upper hand in the war against terrorism. “The Pentagon's plan calls for three rapid-reaction forces to be ready for emergency response by September 2011. The first 4,700-person unit, built around an active-duty combat brigade based at Fort Stewart, Ga., was available as of Oct. 1, said Gen. Victor E. Renuart Jr., commander of the U.S. Northern Command. While I haven’t seen all the details – presumably there are more, two things jump out at me: 1. Concentration is on the warfighting skills that military people bring to the party and 2. PSYOP support for this force would ‘technically’ come from the Reserve Component since these forces are not part of Special Operations and therefore not supported by the 4th POG. As to the first concern, I suspect that there has been scant attention paid to the nature of PAO and how PSYOP forces may be employed as emergency information providing responders. Also I suspect that there has been no guidance issued to develop contingency planning that includes working closely with local mass media (TV and Radio especially), nor has there been much attention to funding the training and travel that would be necessary for assigned military personnel to develop and maintain relationships with local media. An approach to remedy this shortfall might be to employ contingency PSYOP and PAO personnel, either USAR, Guard or retired that have existing links and training. As an example the Red Cross provides excellent PAO training and each chapter has a strong tie to local media because the Red Cross is a very trustworthy and photogenic source. The second issue is one of resources – PSYOP resources are under excessive OpTempo pressure. Given the spirit of nation building likely to be embraced by the incoming administration, DoD (especially perhaps AFRICOM and SOUTHCOM) will likely find themselves more engaged than they are today. This increase will also require PSYOP forces. While small, quick response support packages might come from either the 4th POG or SOCOM, in the main RC PSYOP is likely to bear this burden.